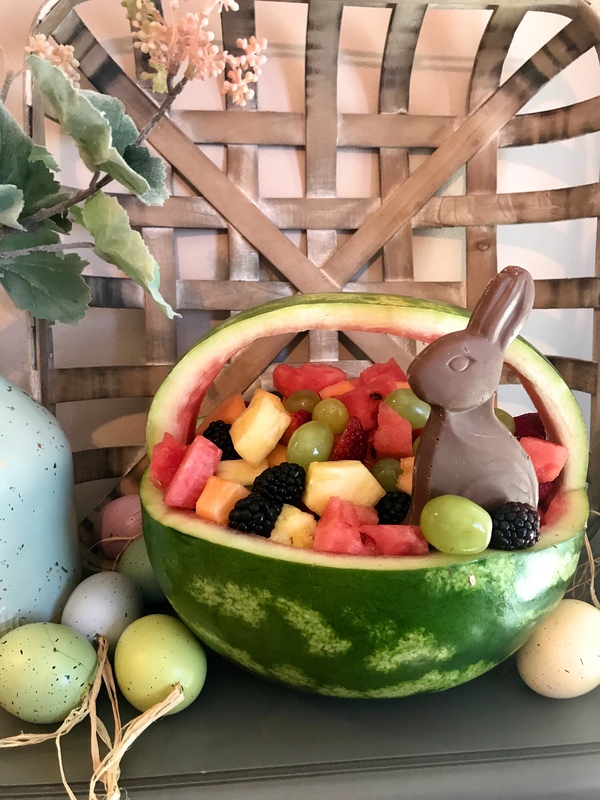 Say hello to spring and Easter parties with this festive Easter basket fruit salad. 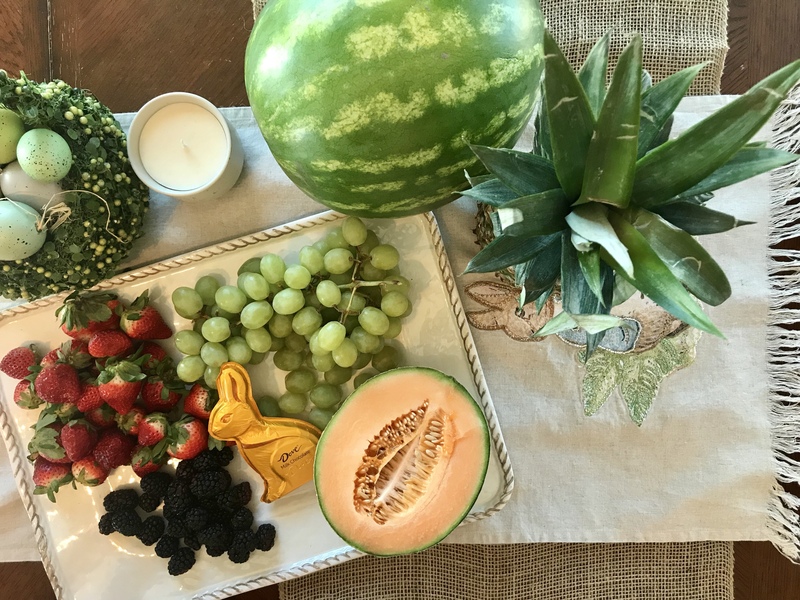 The basket is perfect to fill with fresh and juicy fruit. This will be the hit of the party! 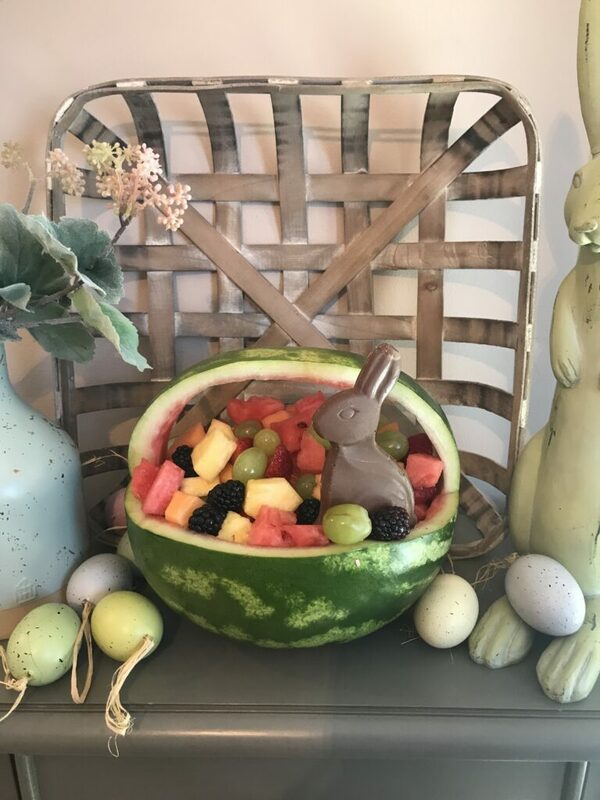 I have been making this fruit basket for a couple years now. 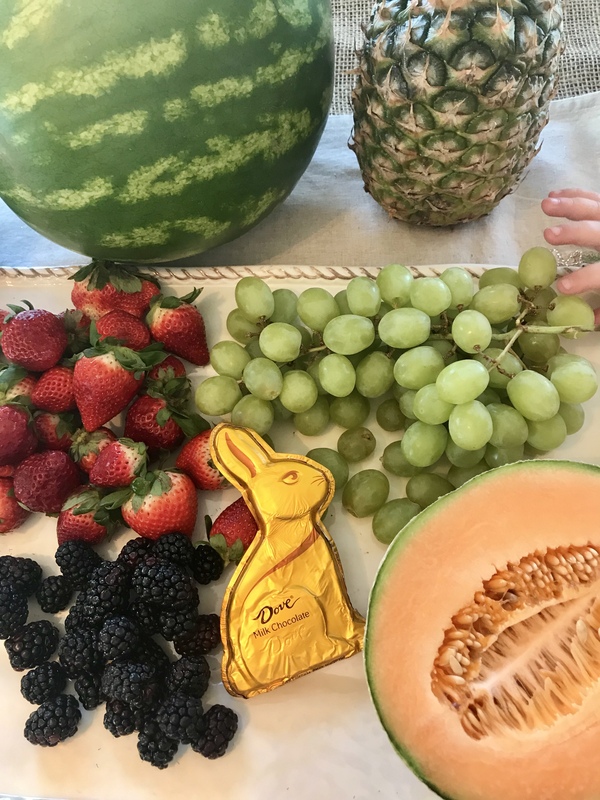 It requires no cooking can be prepped ahead. 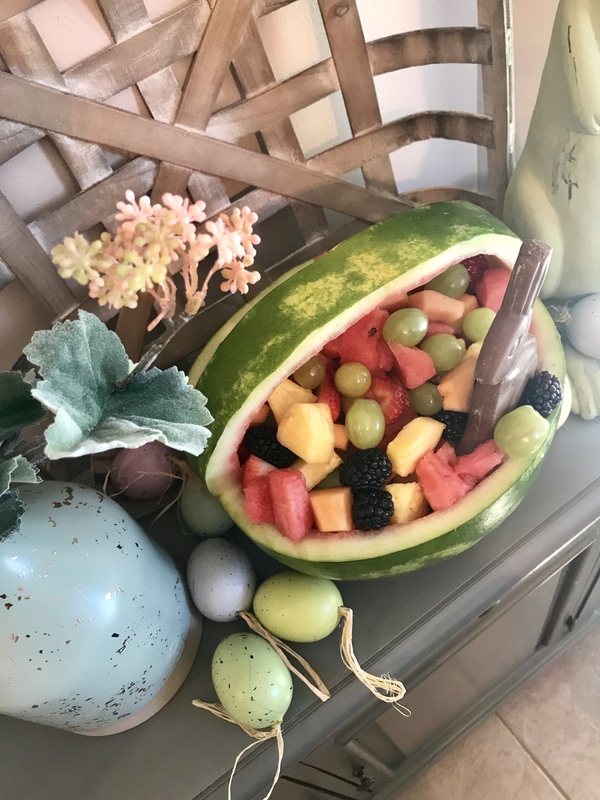 It is very easy and makes an adorable centerpiece! 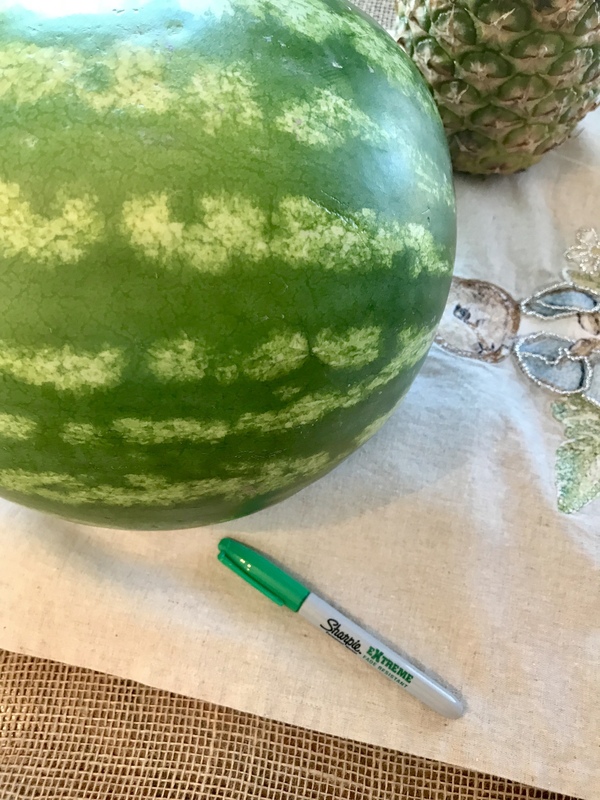 Gather up the fruit and cutting board, knives and a sharpie marker or pen. Here I used a green sharpie because I saw it in the drawer, but any color would do. The lines can be trimmed off so no one will see them. Begin by drawing the basket handle. 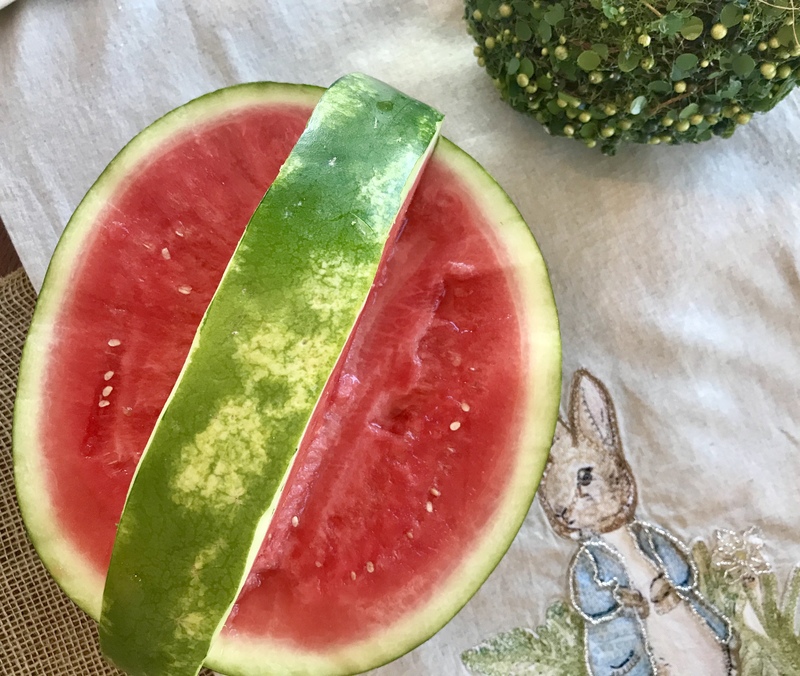 Draw two lines down the center of the top of the watermelon. 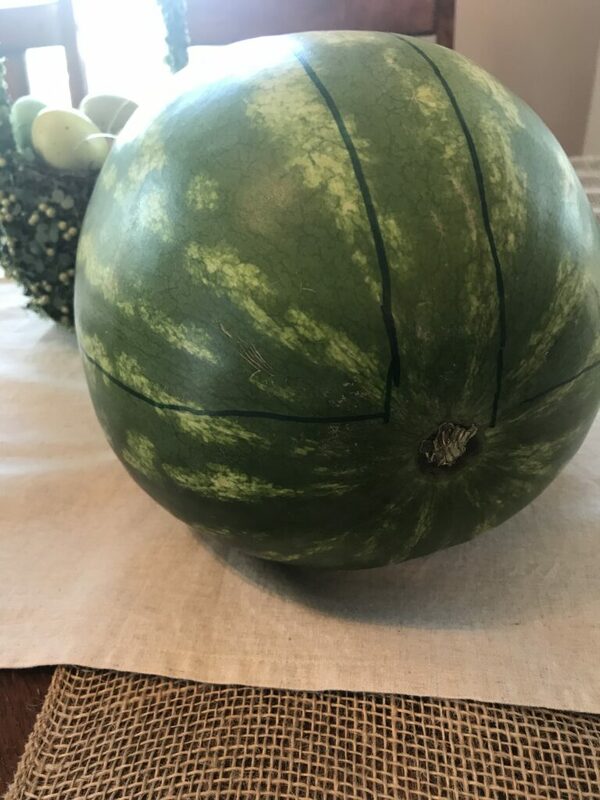 Then connect the two ends of the lines to make the side of the bowl. The shape you cut out will be a wedge. Step back and check the lines to make sure your cutting will not accidentally slice through part of the handle. 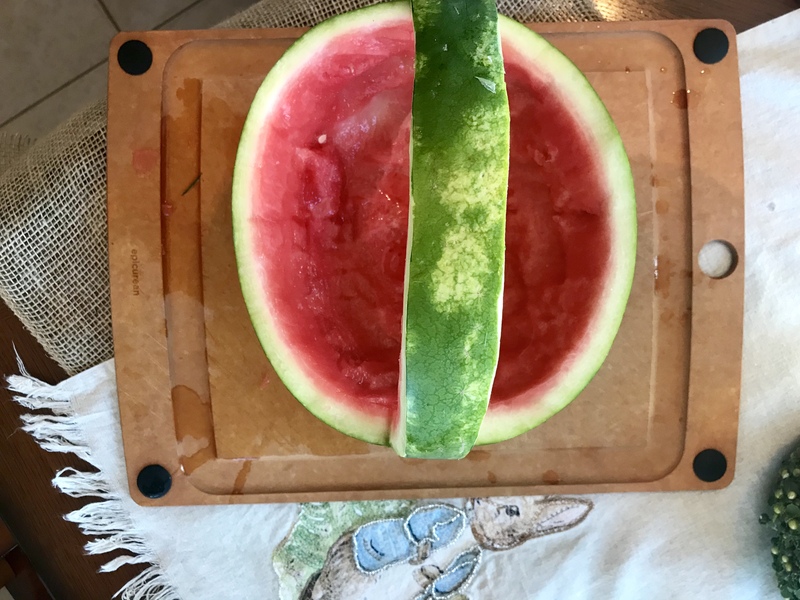 Cut out the wedge on one side and then the other. 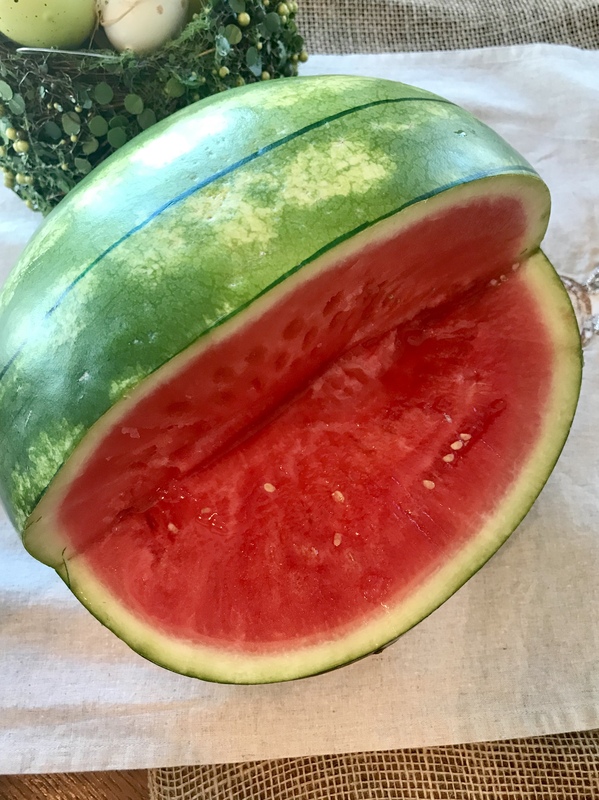 Carefully scoop out the watermelon from the bowl. Cut it into small squares to include in your salad. 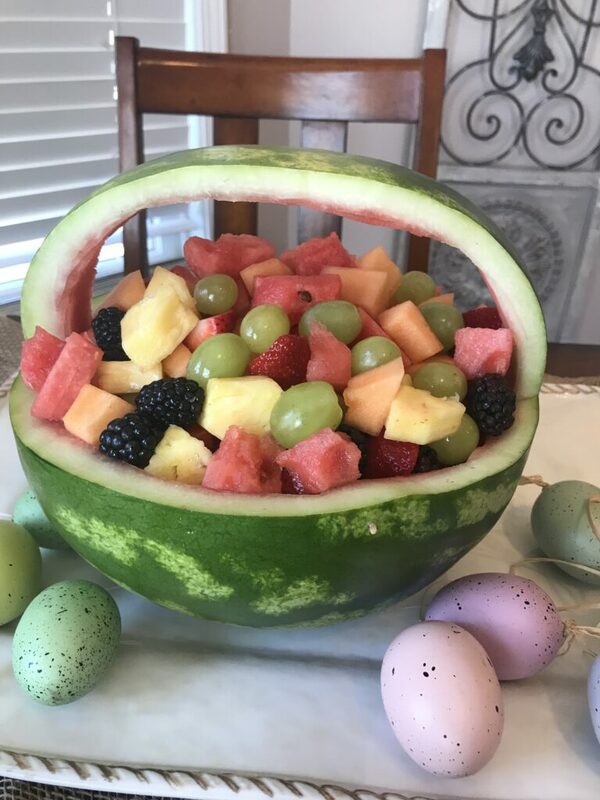 Fill the bowl with your favorite fruits. 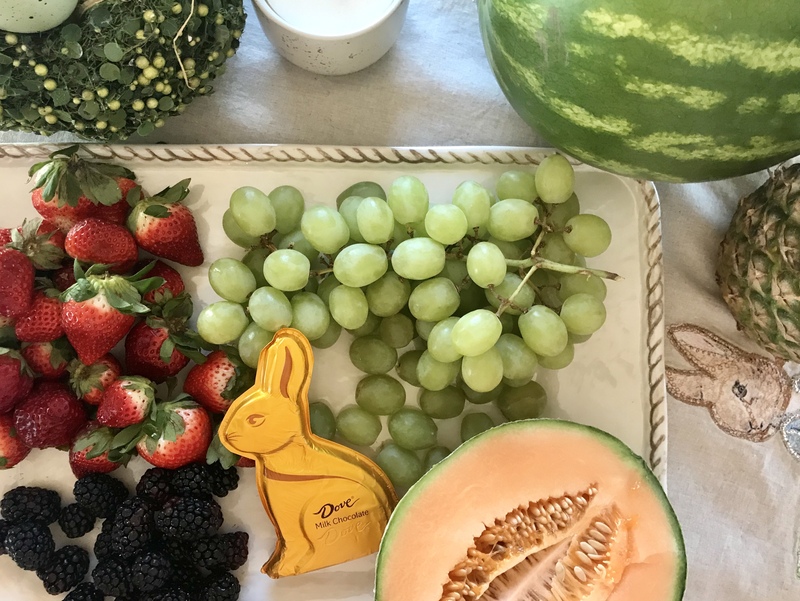 For an extra special touch, add a chocolate bunny to the edge of the basket. 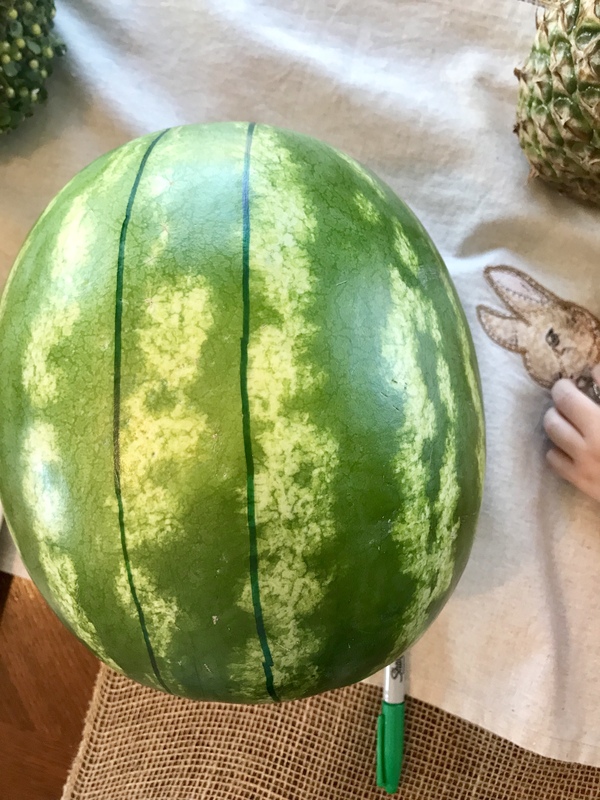 Simply wiggle it in between pieces of fruit and watch the kids fight over it! 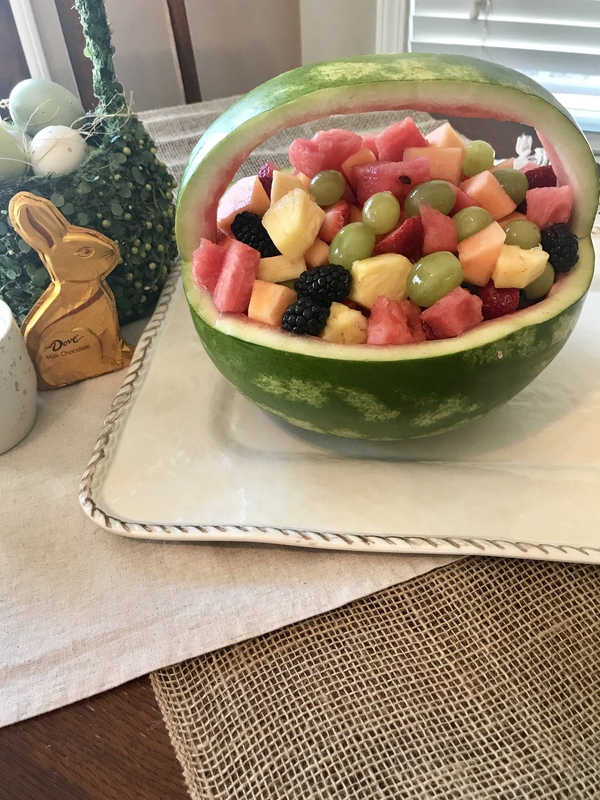 This sweet treat is so fun to make! I hope your family enjoys it as much as mine does! 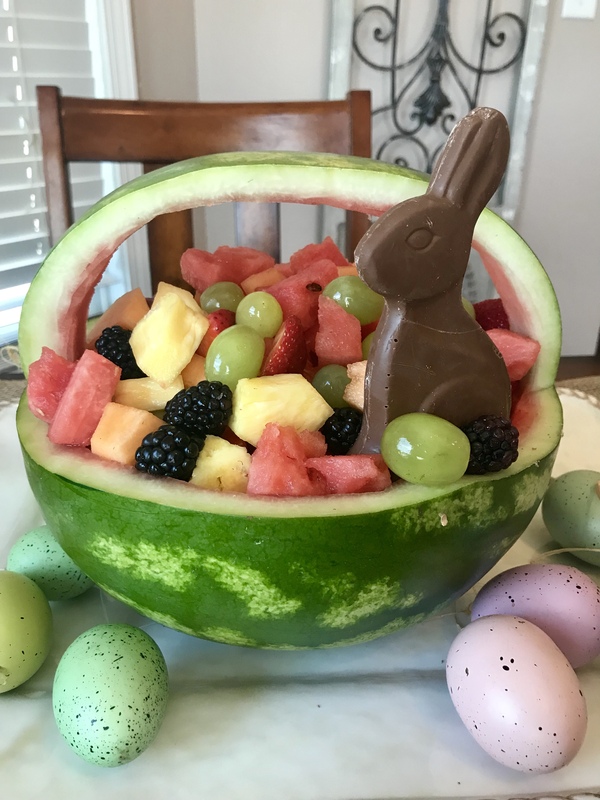 I remember a similar fruit baby carriage at a certain baby shower almost 10 YEARS AGO!! !